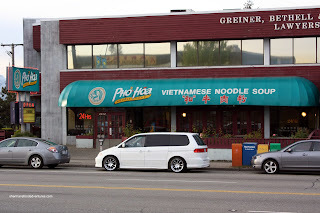 Pho Hoa? Really? 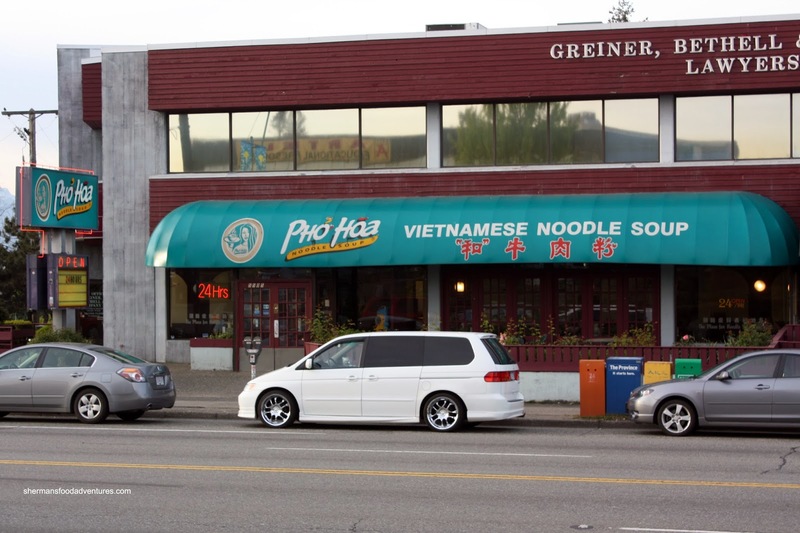 Isn't that the McD's of Pho? Yes, we really had no choice as we missed the last call of the restaurant next door (Bistro 508). Slightly defeated and uninspired, I relegated myself in eating average Vietnamese food. But wait. I hadn't tried the Bun Bo Hue here before. Hence, it was a good opportunity to see how it fared against other versions in the city (I needed to pysch myself up...). The one size for the Bun Bo Hue was rather small with very little noodles and meat. As expected, there was no pork blood nor knuckle. 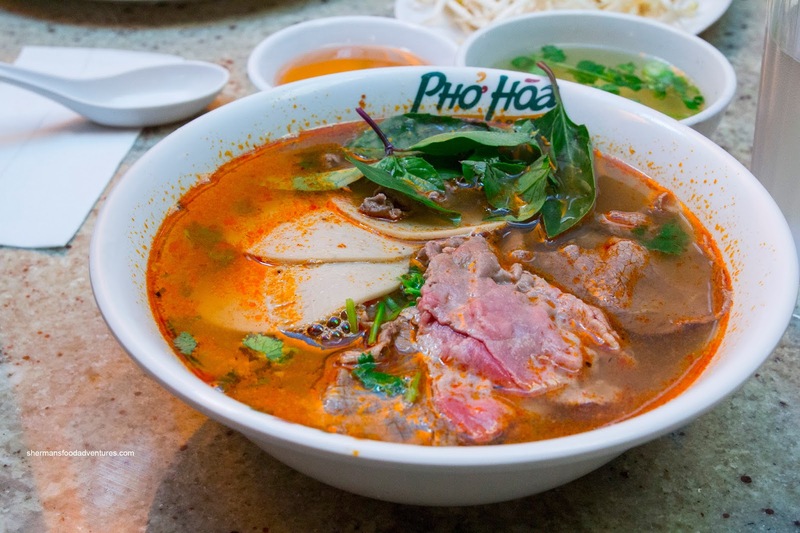 However, that is usually not a deal-breaker if the broth is good. 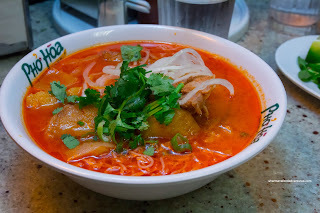 In this case, the broth wasn't exactly bland, but it wasn't aromatic (lack of shrimpiness) nor spicy either. Definitely a run-of-the-mill version which does the job for late-night when there are no other choices. As for the Pho, I give it to them that they are consistent. It was middle-of-the-road where it lacked a real meatiness, yet it was decently flavourful with a certain sweetness and of course MSG. The modest amount of meat was tender enough while the noodles were cooked right. 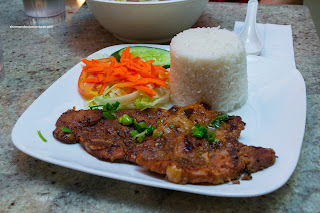 The Lemongrass Pork Chop Rice was again passable albeit with the thinnest pork chops I've seen. Hence, they were pretty much completely dry. They weren't lacking in flavour though as I did pick out lemongrass and a lot of salt. Lionel Hutz ended up with the Beef Stew with Vermicelli Noodles. He remarked that it was not as flavourful as the colour would suggest. It was slightly aromatic while each piece of chicken was okay. 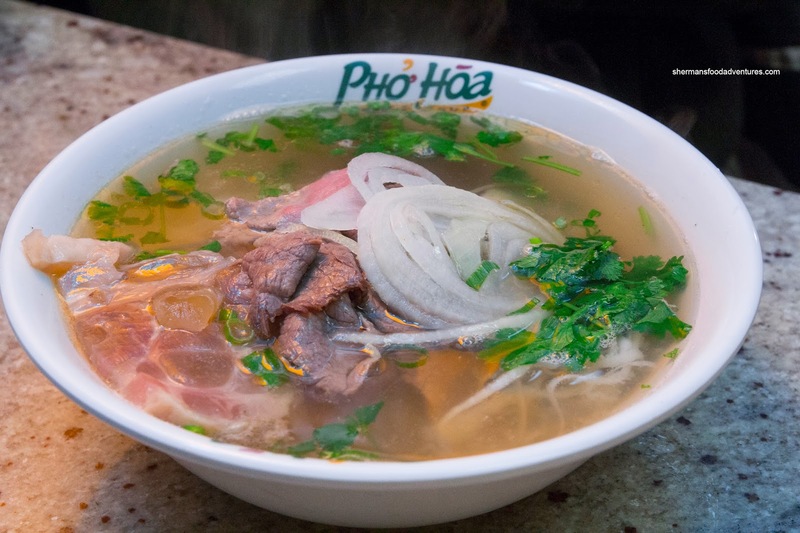 Yah, this was a pretty unexciting post to write, considering that Pho Hoa can be had almost anywhere (with variations of course). However, one cannot deny that it is generally pretty predictable. I guess it makes up for the mediocrity.